Based on NOAA’s 2014 Arctic Report Card, the past 2 decades of ice loss in Greenland has slowed dramatically in 2013-2014. In contrast to Velicogna’s (2014) previously published average mass loss of 280 +/-58 gigatons/year using GRACE satellite data, or the maximum loss of 570 gigatons in 2012-2013, there was only an insignificant loss of 6 gigatons from June 2013 to June 2014, or mere 1% of the previous year’s loss. A loss of 360 gigatons translates into a 1 millimeter rise in sea level, therefore the 2013-2014 sea level rise should be 1.3 mm less than the year before. And based on historical analyses, Greenland will likely begin gaining mass in the coming years. In Vanishing Ice Most Likely All Natural (transcipt here) I argued that Greenland’s glaciers would soon stabilize and sea ice in the Barents Sea would soon recover based on trends in the transport of warm Atlantic water into the Arctic. Although a one-year recovery is much too short a period from which to derive reliable projections, it is exactly what natural climate dynamics predict. 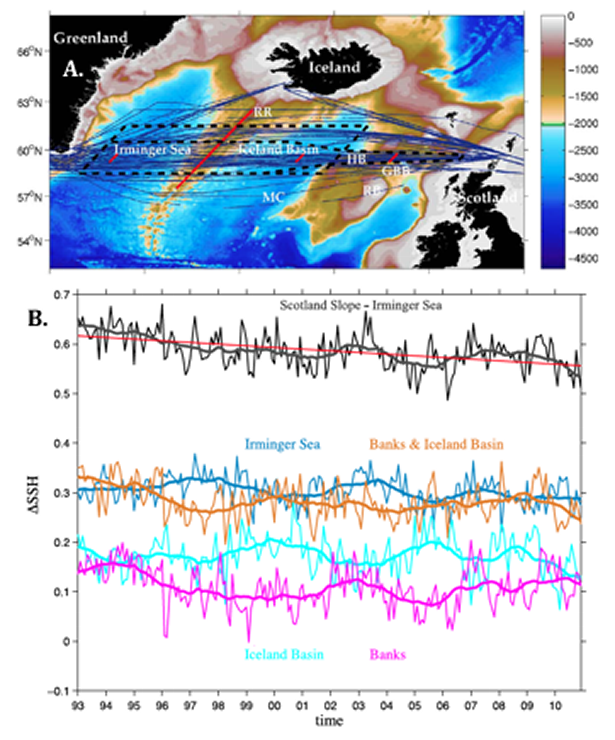 Researchers have measured the inflow of warm Atlantic waters along a line between Scotland and the Irminger Sea (A. below) and have determined how that water was partitioned between flows entering the Irminger Current and the flows entering the basins that feed the Barents Sea. Using satellite altimetry to measure changes in sea level, Chafik (2014) reported the flow of warm Atlantic waters into the Irminger Current had increased significantly between 1992-1998 (B. below), but over the past 18 years the volume of warm water has been declining. Accordingly researchers had reported that large glaciers, like the Jakobshavn with submarine grounding points, had been stable or advancing between the 1960s and early 1990s. Then coincident with the arrival of a warmer water via the Irminger Current, the glaciers abruptly began retreating. Since 1997 the loss of Greenland ice accelerated culminating in the widely trumpeted loss of 570 gigatons in 2012-2013, which was opportunistically portrayed as evidence of CO2 warming. Because the inflow of warm water has been waning since the late 1990s, it suggested that accelerated loss of ice would soon wane as well. Based on the drop in sea level (B. above) the volume of intruding warm Atlantic water has decreased by 10%. If the previous pulse of warm water has been the driving force for retreating Greenland glaciers and melting Barents Sea ice, then that reduced inflow predicts Greenland’s glaciers should soon stabilize while Barents Sea ice begins to recover. Indeed 2014 also witnessed an increase in Barents Sea ice. Likewise NOAA’s 2014 Arctic Report card also stated the “coverage of multiyear ice in March 2014 increased to 31% of the ice cover from the previous year's value of 22%.” Suggesting more ice is surviving the melt season. In addition the mean sea-ice thickness in multiyear ice zone along northwest Greenland has increased by 0.38 m.
But why did the loss of Greenland ice continue to accelerate after the initial 90s pulse of warm water intrusions? The warm intruding Atlantic water is saltier and denser and flows between 100 and 900 meters below the surface. The weight of the glaciers have depressed the continental shelf so it slopes towards the shore (similar to the condition illustrated below for Antarctica’s Amundsen Sea glaciers.). 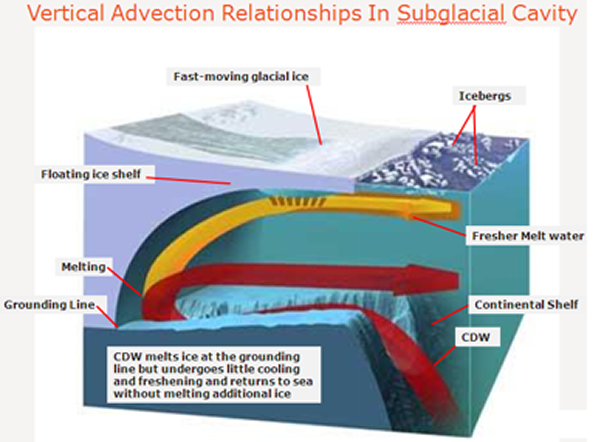 When pulses of warm water are strong enough to rise over the shelf’s outer ridge, that warm dense water then flows downward to the grounding point of the glacier and remains there until a new equilibrium is established via basal melting and a retreating grounding point. Increased basal melting also increases calving of the floating ice shelf and the loss of buttressing power that inhibits the glaciers’ seaward flow. The end result is the glaciers accelerate seaward, causing dynamic thinning, increased calving, and a large loss of ice mass that continues until a new equilibrium is established. The continued reduction of warm water inflows and the dramatic reduction of lost ice mass in 2014, now suggest the glaciers are no longer adjusting to the previous warm water intrusions. Before the Little Ice Age (LIA), Greenland’s glaciers, like the Jakobshavn, were smaller than seen in the present day (Young 2011). During the Little Ice Age between ~1400 and 1850, glaciers grew to their maximum Holocene extent. That LIA advance correlates with 1) lower solar flux, 2) decreased inflows of warm Atlantic water, and 3) a more persistent negative North Atlantic Oscillation. Although topographical features of Greenland’s glaciers will cause each glacier to adjust in a unique manner, overall the recent decrease in solar flux approaching LIA levels, the current decline in warm water inflows, and the current trend to a more persistent negative North Atlantic Oscillation all suggest that Greenland will begin accumulating ice mass over the next decade. In Ocean Gyre Circulation Changes Associated with the North Atlantic Oscillation (NAO) Curry (2001) created a Transport Index illustrating the correlation between the pole-ward transport of warm tropical water and the North Atlantic Oscillation. As seen in their illustration, there was a rapid increase in the pole-ward transport during the 80s and 90s when the NAO was in an increasingly positive phase. In general agreement but supplemented by other atmospheric dynamics, Barrier (2014) suggest increased transport is due to the spin-up of the subtropical gyre during the persistent positive NAO and reduced transport follows a spin-down during persistent NAO- conditions. So why didn’t Greenland’s glaciers begin retreating earlier during the 1980s and 90s? When the NAO is positive, both the sub-Tropical gyre (STG in the illustration below) and the sub-Polar gyre (SPG) speed up and expand. While the spin-up of the sub-Tropical gyre transports more tropical water pole-ward, in contrast the expanded sub-Polar gyre limits how much warm water will enter the Arctic seas. This quasi-blocking effect causes more warm water to be re-circulated equator-ward and stored in the sub-Tropical gyre. 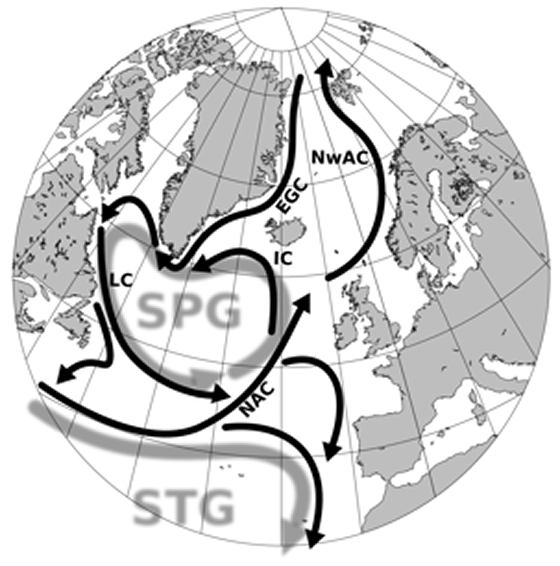 The amount of warm water entering the Irminger Current is particularly limited because the sub-Polar gyre also shunts the pole-ward transport to the east towards the Barents Sea. When the NAO first enters a negative phase the sub-Polar gyre contracts towards the west, allowing more warm water to enter the Irminger Sea. Statistical studies have debated the correlation between retreating Arctic ice and the negative NAO because it generates a confounding short term warming trend that is contradicted by the longer cooling trend suggested for the LIA as well as observed during the 1960s and 70s. But that contradiction is easily explained by the effects of an expanding and contracting sub-Polar gyre (SPG). The initial contraction of the SPG during the early negative NAO allows more warm water to enter the Arctic. However the negative NAO also implies a spin-down of the subtropical gyre and therefore a drop in the pole-ward transport of warm tropical waters. Thus as the negative NAO persists, the initial warm pulse into the Arctic is exhausted and followed by cooling trend decades later. A similar scenario was reported by Bengtsson (2004) in The Early Twentieth-Century Warming in the Arctic—A Possible Mechanism to explain the rapid 1930s and 40s warming of the Arctic and retreat of Greenland glaciers that persisted into the early phase of the negative NAO. With all things considered, the evidence strongly suggests we will soon witness a similar natural cycle and a rebound in the Greenland’s ice. 1. Why was Greenland's Jakobshavn smaller 600 years ago. 2. Why was the Jakobshavn glacier stable from 1960 to 1995? 3. Why did Greenland's ice mass suddenly retreat and suddenly stop retreating in 2014? 4. What is the role of ocean oscillations and pole-ward trasnport of tropical waters?